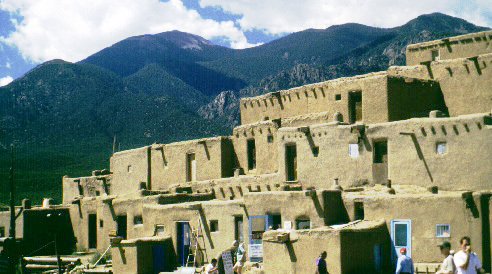 Taos Pueblo, beneath the Sangre de Cristo Mountains, New Mexico. What do we value in our nation? 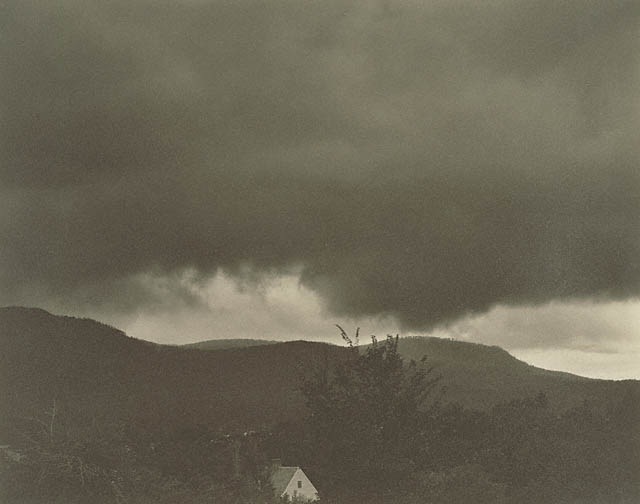 Stieglitz, upstate New York; photograph, 1922. Time: 8-9:15AM, Tuesday, & Thursday. Bush – 176. President Theodore Roosevelt and John Muir in Yosemite Valley National Park, 1903.
enough. If I had plenty of land, I shouldn't fear the Devil himself!" Leo Tolstoy, "How Much Land Does a Man Need?" Class Meeting time is Tuesday & Thursday, 8:00 AM – 9:15 AM. Office and hours: Tues., 9:30 AM-10:30 AM, Wed., 2:00 PM-4:00 PM, Thurs., 9:30 -11:30 AM + by appointment. Grading: Letter grade based on participation, readiness, close reading, writing, discussion, & assignments. 4 credit hours, CRN 90285. The current situation of how human settlements alter their surroundings is a point of departure for environmental history. Environmental history is the study over time of the ecological effects of human interaction with the natural world. Complementary to other disciplines, it emphasizes the dynamic role geography plays in influencing social and economic affairs. Environmental historians study how humans both shape their surrounding environment and are ecologically shaped by land and water conditions. To think critically from the perspectives of ecology and history by demonstrating examples of how national movements for land acquisition lead to a conflict between preservation and development in the conservation of natural resources having lead to the spread of twentieth century environmental protection policies. Student Learning Outcomes for American Environmental History are in the cognitive domain. By the end of this course, students will demonstrate proficiency in five or more of these areas. Active participants should verbally demonstrate and explain in writing the origins, deployment, and extent of the United States land survey system of 1785. Verbally present from a prepared script artistic and photographical portrayals of our national land-use patterns or landscape changes across time. Active participants should use & explain an analogy in writing revealing the specific qualities of settlement patterns including, urbanization, agriculture, or use of natural resources. Delineate in writing contingent concepts related to the contrasting and cumulative impacts of suburbanization on water, land, land-use, and land-use changes in the twentieth century. Demonstrate in writing defining qualities of different values in America with respect to the ecological measures of land, air, and water resources. Explain verbally and in writing by analyzing the clash between preservation and conservation with examples, from significantly different sources. Place in chronological order at least a dozen more significant events and people that reveal growing concerns for protecting national lands, waters, forests, & wildlife from 1800 to 1980. Accurately articulate in writing Henry David Thoreau's significance to the development of the arts and sciences with respect to American thought and attitudes about land, citizenship, and nature. The study of America's natural environment in retrospect is a story about land-use and land use changes created by the needs of a people to thrive and not merely survive. To comprehend the enduring character of how generations of Americans sustained their changing social needs, this course examines the cultural and natural resources as embodied in land and water to better recognize the crossroads whereat we now stand. "From histories we can infer the modes of thought and behavior that are more likely than others to be detrimental to the environment we want to live in. A primary element of such histories should be the social analysis of scientific knowledge construction, because many technologies that are science-based cause so many environmental problems." Elizabeth Ann R. Bird, "The Social Construction of Nature: Theoretical Approaches to the History of Environmental Problems," Environmental Review 11, no. 4 (Winter 1987): 255-264, quotation on p. 255. We read critically in order to actively discuss and examine decisive ideas about national character as portrayed by authors: Emerson, Thoreau, Austin, Pursell, & Du Bois. We do so in order to use written discourse to delineate, explain, & judge competing beliefs of wealth that altered attitudes towards resources. Each of these writers has proposed important foundations for ecological history. Students may demonstrate their understanding of these writings by an ability to clearly distinguish the contrasting and complementary qualities of movements for the protection of rivers, wildlife, or scenic protection as they emerged into social movements throughout the nation's recent past. C clarity, coherent conceptual focus; spelling, grammar & logical consistency. L length & development of your arguments, evidence, ideas, or presentations. I information on facts from the class texts, library research, or interviews. F frequency of examples or substantiation from texts, lectures, notes & readings. S subjects developed as argued in a thesis, introduction, summaries, & concise conclusions. Students in passing the course are expected to demonstrate six of the learning outcomes in their submissions. I am here to entice, excite, & encourage your imagination and capacities to excel in learning new concepts. In allowing participants to practice writing and speaking abilities, I desire to generate meaningful discourse. My purpose is to support your inquiring intellect with significant concepts in a coherent and challenging manner. I anticipate you will ask questions so we all actively learn together to overcome the problems these authors pose for you in achieving superb performance levels based on critical reading. Having begun university teaching in 1972, I still aspire to communicate how personal assumptions and/or biases regarding the content of history so that you, the participating students, may know up front how biases cloud our judgment of the facts because your written comprehension of ideas is crucial to my success. My hopes are that serious participants exceed the customary habits of arriving promptly to class having taken notes from assigned texts for that meeting day. By discussing concepts arising from these readings, do keep in mind that participation involves not only alertness and verbally contributing your ideas, but also listening respectfully without interrupting other speakers who proffer their views on the assigned texts. Paying attention to others and to me is a sign of respect that I will reward. Since using electronic media, texting, or web browsing for other than class purposes is rude; unauthorized texting, internet surfing, e-mailing, or being digitally inattentive to discussions during class meetings counts as an absence, because it robs us of your responses to the texts. I do not tolerate side conversations during class time when other people are speaking. You may regularly contribute verbally your analyses to enrich our class discussions. I reserve the right to guide us back to the author's meaning from the readings assigned for that session. To do well, I expect you may consistently share passages, questions, or findings from the authors when so motivated on the Wiki site. Do submit all course work on the day the assigned work is due. Late papers cannot earn the same credit as those received on time in fairness to the punctual students. This is really because we discuss what you have written in the class on the day these essays are due. Try to plan ahead, always start at least 2 weeks before papers are due, back-up your work as you write, and keep a printed copy of all notes & drafts. The look of any graduate school paper is always professional with an accurate date and page numbers indicating when the document was completed. I ask you to place a cover page with your name, phone number, essay title and an abstract of two to three sentences covering the substance of your essay for purposes of privacy because I make extensive comments on your work. Spelling & grammar errors are unacceptable. The format for the papers should be typed, double-spaced, 12 point sized in Arial or Times fonts. All papers are 2000 words with a maximum of one-inch margins & a minimum of 22 lines per page. All essays have a title based on the paper's contents and clearly marked page numbers [preferably in the upper right hand corner of the pages]. The cover page should have: your full name, phone number, and the date this draft was completed. Do separate the text from a page listing of the literature cited and any notes figures, or graphs you use. Ms. Robertshaw in the Olin Library Writing Center can provide you with a copy of Instructions for Authors. Endnotes or footnotes are preferred rather than the use of parenthesis with author, date, and pages. A final, revised and corrected, essay paper for the term is due on or before April 27, 2015. You submit a draft for my comments no later than April 6. I anticipate that the best parts of your writings and papers will be shared or verbally presented in class and parts will be posted on the Wiki. 1. Class attendance and participation policy is based on you and the importance of your personal contributions during class and outside of class by posting your responses to class discussion on the course wiki. I often begin the class with a prompt based on the assigned reading for that day. I ask you to write about that prompt in order to record your response to the author's ideas. Response to my e-mails is part of this policy. During class I pass around an attendance sheet (which I tally up at the need of the term to determine the frequency of your accurate responses to a question I pose on the sheet). On that page you are asked a question about the readings for that session and you have the opportunity to answer the enquiry. The use of these texts in a final essay should demonstrate verbally and in writing concepts based on analysis of the challenges posed by the dust bowl to agrarian values and suburbanization to ecological measures of impact on land and water resources. In addition to three open book examinations, students will contrast verbally and in writing the different descriptions of: Alfred Crosby, on Corn, attitudes & Ecological History, Ralph Waldo Emerson of Nature in New England, and W. E. B. Dubois of the Georgia Black belt with respect to the agricultural use of land, when beginning Egan's Dust Bowl book . (1) Create a storyboard with chronological sequencing of one portrayal to the next. (2) Interpret the material used by describing the scene, tie that to ideas in the text, & convey the changes that occurred speculating on the impacts of land-use based on the readings. (b) Essay – In writing and revising this paper based on all of the authors, you should pay particular attention to the development of ecological understanding of land and water protection in the rise of conservation. In a 2000 word (minimum) paper use the authors to convey what triggered and sustained the preservation and conservation movements that led to environmental protection today. (c) Three open-book and open note exams are based on the required texts: Siry, Egan & Rome. Grades are earned based on the work you submit expressing comprehension of land-use from the books by use of multiple examples & especially contrasting one author's ideas with the others. The quality of your writing grades is based on a rubric that is posted on Blackboard™ for you to review before you submit a paper. I count the number of references and frequency of citations in all of your papers. The quality of your class participation grade is derived daily from your particular references to the texts when speaking. By reading or referring to extensive passages in the books, or to information from use of the class web site or wiki, you may improve your participation grade for the days you are in class. The goal here is for you to practice verbal communication skills in order to inform yourself and others of a book's meanings. VII. Academic accountability, honesty, and writing with integrity. Cheating, borrowing ideas, or copying without proper citation diminishes the integrity of any writing. The habitual resort to these less than responsible practices amounts to plagiarism–a most serious academic offense of novices and experts alike. By the use of words or ideas that are not your own and are insufficiently accredited, or not acknowledged at all, you undermine an essay’s reliability. The consequences are that you can fail that project, or even fail the class, since these offenses are a violation of the College’s honor code. As such, I am obliged to report such violations to the Dean. Each student in this course is expected to abide by the Rollins College Academic Integrity, Honor Code. Any work submitted by a student in this course for academic credit will be the student's own work. [Optional: For this course, collaboration is allowed in the following instances: study groups & wiki postings.] You are encouraged to study together and to discuss information and concepts covered in lecture and the sections with other students. You can give "consulting" help to or receive "consulting" help from such students. However, this permissible cooperation should never involve one student having possession of a copy of all or part of work done by someone else, in the form of an e-mail, an e-mail attachment file, a diskette, or a hard copy. All help must be stated in writing on any submissions to the instructor. During examinations, you must do your own work. Talking or discussion is not permitted during the examinations, nor may you compare papers, copy from others, or collaborate in any way. Any collaborative behavior during the examinations will result in failure of the exam, and may lead to failure of the course and disciplinary action. Should copying occur, both the student who copied work from another student and the student who gave material to be copied may both automatically receive a zero for that particular assignment. "On my honor, I have not given, nor received, nor witnessed any unauthorized assistance on this work." 23 Voices of the past; voices from your past? 25 Crosby, Germs, Seeds, & Animals -- selection see Blackboard™ or your e-mail. For week two see: Studies in Ecological History and these links below. 10 Comparing five points of view to your own: Tell us who you are and what influences your attitudes about ecology. 17 Legacy of the Naturalists compared to the pioneers on the frontier; Summary of naturalists in relation to commerce & agriculture. 6 Reports -- Written and verbal reporting of what you wrote about. Select five authors (See, only as an example) in the Siry text that reveal how misunderstood ecological (natural) ideas were with respect to land, air, energy and water; plants, animals and all living things in ecotones. 8 Fall break, no class. 20 Settling the high frontier Egan, pp. xi - 58. 22 Learning lessons about land and the ecology of soil. Egan, pp. 59-135. Farm in Dalhart Texas, 1938. 27 Land & landscape Finish Egan, pp. 59-135 & Start Egan, pp. 136-197. 29 The Consequences of misfortune and climate. Egan, pp. 136-197. USDA History of the dust bowl. book Contents. Readings. learn Clarify. learn ... The Worst Hard Time: One: Paradox | Two: Folly & Fix | Three: Sensory reality. 12 How was conservation redefined by measures that were developed to deal with the problem? Continuing the discussion of Egan, pp. 273-314. Book Notes: Bulldozer in the Countryside, Adam Rome; 2001. 24 Rome, pp. 119-188: What defines suburbia? 26 Thanksgiving break, no class. What | When | Where | How | Housing boom | Adam Rome's Argument | Sources ... Next. Adam Rome's history. book. Contents · Overview · Part One · Part Two. IX. Accommodations: A statement about accommodating students with significant concerns. Rollins College is committed to equal access and does not discriminate unlawfully against persons with disabilities in its policies, procedures, programs or employment processes. The College recognizes its obligations under the Rehabilitation Act of 1973 and the Americans with Disabilities Act of 1990 to provide an environment that does not discriminate against persons with disabilities. Share their unique experiences, values, and beliefs. Be open to and respect the views of others. Appreciate the opportunity that we have to learn from each other in this community. Value each other’s opinions and communicate in a respectful manner. Keep confidential discussions that the community has of a personal (or professional) nature. Use this class opportunity together to discuss ways in which we can create an inclusive environment in this course and across the Rollins community. XI. The time you spend on this course is the subject of a College wide policy on "Credit Hour Statement for Rollins Courses Meeting 150 Minutes Weekly for Four Credit Hours during 15-Week Semesters"
This course is a four-credit-hour course that meets three hours per week. The value of four credit hours results from work expected of enrolled students both inside and outside the classroom. Rollins faculty require that students average at least three hours of outside work for every hour of scheduled class time. In this course, the additional outside-of-class expectations are for you to write and revise your writing for the wiki, meet in groups to discuss the readings, and have at least one office visit before the mid-term. Every week summarize the readings and lectures on the WIKI by posting no less than 500 words of writing in your own expression and style of what A) main ideas, B) events, C) people and places were significant in the readings. To obtain credit for out of class work you may document your frequent meetings with Reference Librarians, tutors, and writing consultants in the Olin Library. You may use the College Archives to interpret the documents there on the history of Mead Botanical Gardens, or Lake Apopka. You may interview members of the community about ideas you have derived from the readings, class discussions, Media-site lectures, and videos. We live in a world where fraud and misrepresentation are more rampant than one may desire. You and I are better than that, so that I would hope our enduring acquaintance with each other is based on the care we take in how and what we say to one another in the work we do together to learn about how together we may improve your skills and perhaps leave our world in a better condition than we found it. Do we devour the world to improve what we leave behind, or merely to exist? Additional resource readings on history, education, and ecology to answer that question. Bates, Marston (1960). The Forest and the Sea. Bookchin, Murray, (1982). The Ecology of Freedom. Capra, Fritjof. (1999). The Web of Life. Carson, Rachel (1962). Silent Spring. Christianson, Gale. (1999) . Greenhouse. Crosby, A . (1986). Ecological Imperialism: The Biological Expansion of Europe, 900-1900. Crosby, Alfred. (1992). Germs Seeds and Animals: Studies in Ecological History. Dewey, John. (1938). Experience and Education. Collier Books. Emerson, Ralph Waldo. (1836). Nature. Hardin, Garrett. (1978). Filters Against Folly. Huth, Hans. (1957). 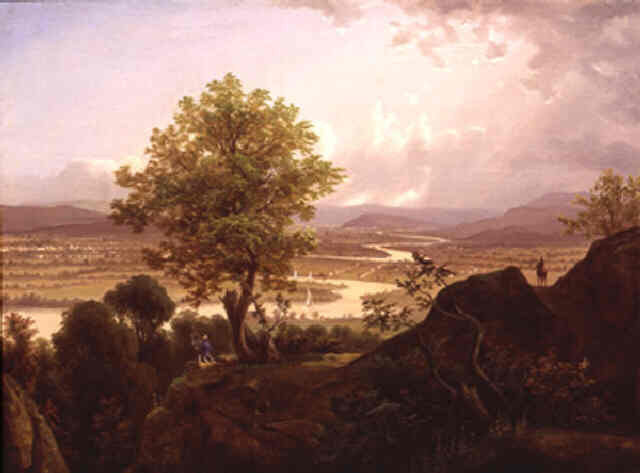 Nature and the America: Three Centuries of Changing Attitudes. Krebs, Charles K. (1988). The Message of Ecology. McHarg, Ian. (1968). Design with Nature. Marx, Leo. (1964). The Machine in the Garden: Technology and the Pastoral Ideal. Merchant, Carolyn. (1999). Problems in American Environmental History. Mumford, Lewis. (1931). The Brown Decades. Nash, Roderick Fraser. (1968). American Environment: Readings in the History of Conservation. Orr, David. (1991). Ecological Literacy. Petulla, Joseph. (1982). American Environmentalism. Pursell, Carroll. (1995). The Machine in America. Reisner, Marc. (1986) Cadillac Desert. Thoreau, Henry David. (1862). "Walking." Williams, Terry Tempest. (2008). The Open Space of Democracy. Worster, Donald (1977). Natures Economy: The Roots of Ecology. Worster, Donald. ( 1979). Dust Bowl. Worster, Donald (1992). Rivers of Empire.